Saju John Mathew (known as ‘Saju’) is a servant of God, who wants to be “obedient to the heavenly call.” As a schoolchild of 13 years old, he knew his Lord and Savior Jesus. Along with his friends, he started witnessing Jesus in the school, and in the streets. When he was in 12th grade, God asked him to start a journal in “Malayalam” language. The name of the magazine was “Maruppacha,” which means “Oasis.” That became one of the most read journal among the born again community of his province. As a university student, he laboured much in the conception, beginning and growth of the “Inter Collegiate Prayer Fellowship,” the fellowship of the students of the full gospel churches. After the journalism studies, he concentrated in writing books and teaching Bible. He was part of ship “Doulos” of Operation Mobilisation for some time. In 1994 God asked him to start a pioneer mission movement in North India, and that was the beginning of “JESUS MISSION”. However, God wanted him to continue as a Bible teacher. 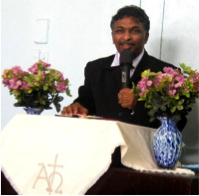 He has inspired many to dwell in the living word of God, across the Indian sub-continent and the land of Africa. This website is endeavoured at showcasing his numerous works like recorded messages for free to many, so that they be a cause of blessings to them. Saju still works with the missionary organization Jesus Mission India, which has done a great deal in touching the lives of many people in the remote villages of North India. 0 Responses to "Holy Spirit - Class 06"